New release to close off the year! A quick one today. 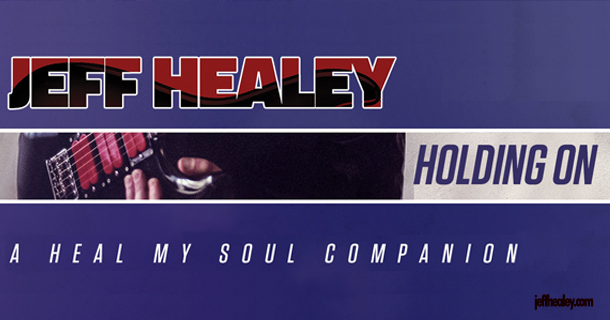 We are very pleased to announce a brand new release from the vaults – ‘Holding On: A Heal My Soul Companion‘! It’s the perfect bookend to critically acclaimed ‘lost’ Jeff Healey album, ‘Heal My Soul’ and 2016 in general, a year which saw an incredible continuous celebration of what would have been Jeff’s 50th birthday. The record will be released at the beginning of December worldwide, courtesy once again of our dear friends at Convexe Entertainment and Mascot/Provogue. Here is a quick taste… Jeff and our pal, the inimitable Pat Rush ripping into ‘I Can’t Get My Hands On You‘, live in Oslo! Dig! In May, The Estate, with production partners Live Nation put on a spectacular concert at Toronto’s legendary Massey Hall, ‘Jeff Healey: A 50th Celebration’. The show featured performances by Philip Sayce, Canadian superstars The Trews, Walter Trout, Sonny Landreth, Albert Lee, Special Guest Randy Bachman and more! All proceeds were donated to World Eye Cancer Hope (WECHope) and organization that works with pediatric retinoblastoma patients (rb is the cancer that cost Jeff his sight by the age of one). On July 1st (Canada Day), Convexe Entertainment released a special digital single of Jeff covering the Canadian classic ‘Oh, What A Feeling!’, recorded live at Jeff’s club just a few short months before his untimely passing. This September, Jeff was inducted into the Mississauga Music Walk of Fame, joining such luminaries as Oscar Petersen and Ronnie Hawkins. Also in September, the cult classic that still stands out for so many Jeff Healey fans, ‘Road House’, was re-released as a special 2 disc blu-ray set by Shout Factory (with a brand new featurette ‘The Music Of Road House’ focusing on Jeff’s contributions). …and now ‘Holding On: A Heal My Soul Companion‘! Stay tuned folks, more details coming soon! Great release. I’m currently still enjoying it. I am so excited for the new release! I hope they keep on coming! Venice Beach, California here! I caught Jeff Healey back in like 1987 when he came north of Malibu at a joint called TRANCUS on the Pacific Coast Highway; we had gone to see local heroes CANNED HEAT and Jeff was the opening act! Nobody had heard of this guy yet! WOW!!! He looked like a school-boy with a white short sleeved shirt and black tie, and the three piece left everyone with dropped jaws! The place cleared out when we were all invited to a CD release party in HollyROCK! I will never forget, and I love “HEAL MY SOUL”, excellent! Got my cd of Holding On and it is awesome!